Twenty-five years ago, a blue speedster ran his first loop-de-loop on South Island and captured our hearts. Sonic the Hedgehog made a ton of friends and foes, and has travelled through a great many locales and environments since then, ranging from the colourful and fantastic to the familiar and lifelike. To celebrate his silver anniversary, SEGA and art dealership Cook & Becker will be releasing a commemorative art book. The book will encompass the expansive history of the franchise and include a variety of design sketches, official character illustrations, in-game art, pixel art, rare promotional art and game box art, all on top of never-before-seen art and interviews with key artists and designers who worked on the franchise over the years. 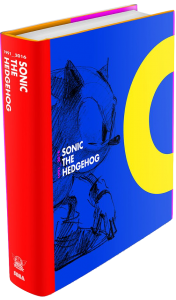 The Sonic the Hedgehog 25th Anniversary art book will launch in early 2017, with preorders opening sometime over the next two months. SEGA and Cook & Becker previously collaborated with an official print by Paul Veer. I would love to get this. I’m wondering about that sonic x box set as well, it just kinda disappeared into nothing. Collection 1 is coming November 8th, and Collection 2 is coming December 6th, I think. Oh okay, thank-you. I live in England and it didn’t show up on Amazon. I didn’t realise until now it only showed up on the US one. If there is Riders and Riders Zero Gravity content, then i may give a look at this book. Otherwise they can keep it. I like art books. I’m probably gonna buy it when it releases. If the collection of art is robust and not just limited to press assets or official art, then I’m in. You can only cull your references for the internet for so long. Man, can’t wait to see some of the content that’s in this book..! Hopefully TSS will do an article about it with some scans or something. Thanks so much for the coverage, Vizard!! Something this good always comes with a catch. This one must be purchased. No matter the cost.